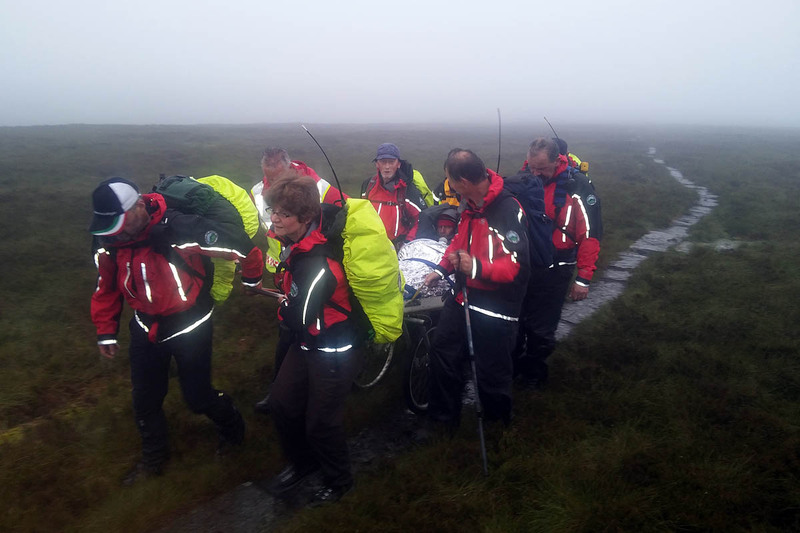 A walker who spent 15 days on the Pennine Way had to be rescued almost within sight of his goal after injuring himself. The 70-year-old man was attempting the journey from Edale in Derbyshire to Kirk Yetholm in the Scottish Borders when he slipped and broke his ankle at tea time on Saturday. Border Search and Rescue Unit was called out to aid the walker. Team spokesman Damon Rodwell said: “Negotiating wet and slippery slabs through the bottomless peat bog on a remote stretch of the Cheviots he lost his footing, fell heavily and broke an ankle. “With night approaching and a nasty weather forecast starting to materialise, he put through a call to mountain rescue and teams were dispatched from both sides of the border. A Border Search and Rescue member who lives just a few miles from the walker’s location was first on the scene. After confirming his position with his colleagues by radio, he assessed and stabilised the injury, made the man comfortable in an emergency shelter and waited for the stretcher party to arrive. Mr Rodwell said: “He’s one of that stoic generation. “Immediately he realised that his walk had come to an abrupt end, he dragged himself into a hollow to escape the blustery wind, wrapped himself in all the spare layers he could muster, took some painkillers from his first-aid pack and summoned help. Mr Rodwell said the injured walker had a fairly long and bumpy ride over this rough and boggy section, which he bore in good spirits, exchanging banter with the nine BSARU and one Northumberland team member who were doing their best to keep the stretcher moving while trying to avoid sinking into the bog themselves. Team leader Stuart Fuller-Shapcott said: “It was a text-book job. We’ve been busy providing first-aid cover at the various ride-outs that are taking place across our area through the summer, but a genuine life-or-death hill callout reminds us why we all volunteered for Mountain Rescue in the first place.